The announcement by Steward Community Woodland near Moretonhampstead that most of the twenty-one residents have now left, and that their homes and other structures are being dismantled, should send a shudder through all of us. It is the consequence of an enforcement notice issued by Dartmoor National Park Authority following the loss (in August 2016) of an appeal against refusal of planning permission for permanent residency, combined with the refusal of the Park Authority to countenance a new application for low-impact dwellings in the 32-acre woodland (which is owned by the community). This is one of the worst environmental outcomes that I am aware of, having studied Dartmoor for more than fifty years. Future generations will be astonished that this has happened in one of our national parks, which are often hailed as leaders in environmental protection. After 67 years of existence it is surely not too much to expect Dartmoor National Park to be a beacon of environmental and social awareness, with well thought-out policies on how the resources of Dartmoor can best be used for the communities that live there, as exemplars of what could happen elsewhere? But it seems we are still light years from that happy state. Some of us were encouraged by a policy (DMD30) in the Development Management and Delivery Development Plan Document adopted by Dartmoor National Park in July 2013, which specifically allowed low-impact residential development in the ‘open countryside’. Anxious to comply with the criteria in this policy, and to address the concerns of the Planning Inspector who refused their Appeal in 2016, in the autumn of 2017 the members of Steward Community Woodland submitted a detailed proposal to the national park for an imaginative new scheme of roundhouses and an ‘innovation centre’, which would be a base for the study of low-impact living. Extraordinarily, the response of Dartmoor National Park Authority has been negative to an extreme (as it has been for the past 17 years). Rather than allowing the application to take its course, with opportunity for public comment and debate, they would not even validate it. They claimed that the roundhouse built by two members of the community from their own wood, straw bales, cob and turf, was not of appropriate design or scale for any other structures, and would not fit policy DMD30, which, on their interpretation, was meant to apply only to tents and yurts. This is despite Pembrokeshire Coast National Park having given permission for many roundhouses of similar type. Moreover, no sensitive person could say that the roundhouse in question was not a thing of beauty, to be marvelled at for the skills, craftsmanship and sound environmental criteria used for its construction. This story is, sadly, one of overbearing authority unable to grasp intellectually or practically the benefits to be gained by Dartmoor as a whole from the Steward Wood settlement. How can a planning authority allow controversial new housing developments on greenfield sites in Chagford and elsewhere, and yet not embrace genuinely low-impact dwellings by an established and respected community in their own woodland, hidden from public gaze? Many people on and beyond Dartmoor have for years recognised and celebrated these contemporary woodland dwellers, for the new and hopeful messages they brought all of us. They are inheritors of a marvellously rich cultural history, millennia old, contained within our Dartmoor woods. Those who know Steward Community Woodland, and what it aspired to, should seek out David Spero’s wonderful book Settlements (2017), which documents photographically Steward Wood and other low-impact communities in Britain. Unfortunately the present situation indicates that Dartmoor National Park Authority actually has no deep understanding of the environmental crisis affecting our planet, and no flexible will to allow serious practitioners the opportunity to demonstrate alternative lifestyles. This is surely not the sort of cultural behaviour to expect from a national park, which should be open to all new environmental approaches, and it is deeply concerning. We are thus all diminished, and Dartmoor’s soul has lost a spark of hopefulness for our future human relationship with the land. 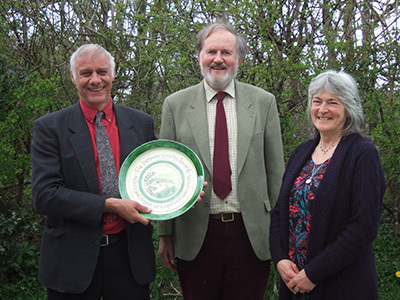 At the 18th Annual General Meeting of The Dartmoor Society, held at Belstone on 23 April 2016, Dr Tom Greeves, Chairman of The Dartmoor Society presented Widecombe farmers Miles and Gail Fursdon with The Dartmoor Society Award 2016. It is in the form of a finely hand-crafted ceramic plate made by potter Penny Simpson of Moretonhampstead and calligrapher Susanne Haines of Bovey Tracey. The plate is inscribed ‘for a superlative hydro system’. ‘The microhydro system at Old Walls, Ponsworthy, near Widecombe, is probably the finest example we have of making wise use of Dartmoor’s core renewable resource of water, in a traditional way but with a modern purpose. ‘We have watched its creation and use since 1995 with fascination, and have visited it twice – in 2004 and 2015. It is a visionary scheme, developed with considerable practical skill and imagination, just as many of the ‘old men’ of Dartmoor would have tackled the problem of getting water to corn and tin mills. ‘The leat that was newly created from the Webburn river is a masterpiece of construction and an ecological wonder. The turbine house is small-scale and a regular home to a family of dippers. ‘The electricity generated is fed into the national grid but is the equivalent of providing the energy needs of about 90 homes. ‘It is an inspirational project which Miles and Gail have shared as widely as possible with the local community, by organising walks, etc. Dartmoor is immensely proud of what they have achieved and this Society is delighted to recognise this outstanding enterprise’. 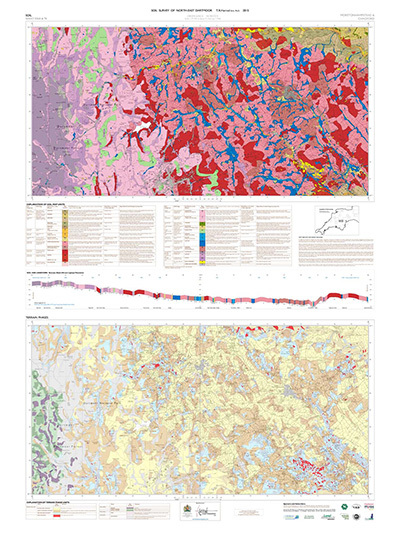 A pioneering Soil Map of North & East Dartmoor is to be launched at the Chagford Show on 20th August 2015. The wonders of Dartmoor ‘above ground’ are known to us all, but not many of us give much thought to what is below the surface. Not so Dr Tim Harrod, (formerly of the Soil Survey of England & Wales 1965–2001) who has spent much of his working life discovering the composition of the ground beneath our feet. This work has now resulted in a new map of North & East Dartmoor Soils that will be launched on the Dartmoor Society stand at the Chagford Show on 20th August 2015. The map is the culmination of many years of research into Dartmoor Soils by Dr Harrod both in his capacity working with the Soil Survey, and by research carried out after his retirement. 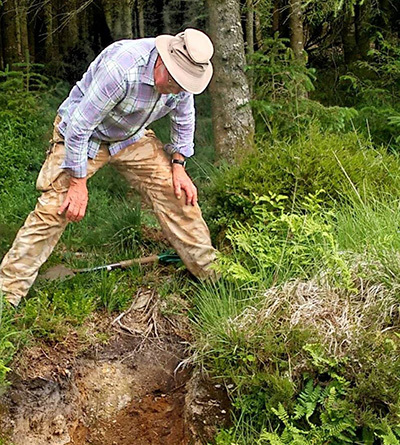 The unfinished Soil Survey of Devon, whose completion could not be funded, has now been completed singlehandedly for this area of Dartmoor, by Dr Harrod in his own time. The area covered is nearly 50,000 acres of ground in the Chagford and Moretonhampstead area of Dartmoor, ranging from the deep peat of the high moor to a wide variety of enclosed land. Cartography for the map was carried out by internationally recognised cartographer Hanno Koch based in Manaton. Soil types found in the area are identified by colour, conforming to the recognised soil classification system for England and Wales and the whole mapped area is overlain by the Ordnance Survey map, so it is easy to locate specific places and their soils. There are in fact two maps – one is soils and the other terrain. 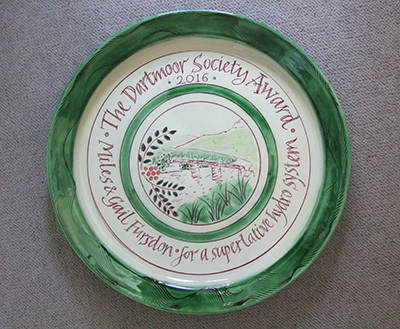 The Dartmoor Society recognised this pioneering work when Dr Harrod was presented with the Dartmoor Society Award 2014. It was also the first organisation to make a grant towards the publication of the map. Since then, many organisations and individuals have been involved including Dartmoor National Park Authority, Dartmoor Trust, Dartmoor Preservation Association, Dartmoor Mires Project, Upstream Thinking, Land Research Group, Land Research Associates and the Stapledon Memorial Trust. Dr Harrod is in the process of writing an accompanying ‘Record’ – the story of how the Dartmoor Soils Map was created and how it was finally able to be published. The map will be on display on the Dartmoor Society stand at the Chagford Show and copies will be available for purchase on the day or can be obtained from Dr Harrod – 01647 24330. Base map credit Ordnance Survey and Dartmoor National Park Authority license No 100024842. 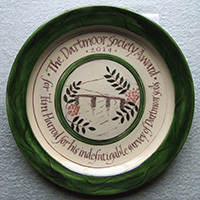 At the 16th Annual General Meeting of The Dartmoor Society, held at Scoriton on 5 April 2014, Dr Tom Greeves, Chairman of The Dartmoor Society presented soil scientist Dr Tim Harrod with The Dartmoor Society Award 2014. It is in the form of a finely hand-crafted ceramic plate made by potter Penny Simpson of Moretonhampstead and calligrapher Susanne Haines of Bovey Tracey. The plate is inscribed ‘for Tim Harrod for his indefatigable survey of Dartmoor soils’. ‘Tim Harrod worked with the Soil Survey of England & Wales from 1965 until 1987 when it was disbanded by Michael Joplin, Minister of Agriculture & Fisheries, who considered it ‘an expensive nonsense’. Upon retirement in 2001 Tim Harrod took up the challenge of completing the unfinished work of the Soil Survey in Devon, by single-handedly mapping the soils of nearly 50,000 acres of ground in the Chagford and Moretonhampstead area of Dartmoor, ranging from the deep peat of the high moor to a wide variety of enclosed land. ‘His achievement and his contribution to the understanding of the county’s environment is second to none, and is reminiscent of some of the great pioneer surveys of our landscape in the 18th century. ‘The Society recognises this outstanding work, and hopes that this Award will help Dr Harrod attract the funds necessary for publishing his masterwork. The Dartmoor Society has already made a grant towards it. Should anyone wish to contribute to publication of Tim Harrod’s survey, please contact Tom Greeves in the first instance (tomgreeves@btconnect.com or 01822 617004). Stop the Dartmoor Mires Project! The following was issued as a Press Release on 12 June, 2013. Dartmoor National Park Authority is yet again poised to send large digging machines into one of the remotest parts of Dartmoor – this time, in August, to the watershed between the rivers Tavy and Cowsic (a tributary of the Dart). The site is nearly four miles from the nearest public road, with no existing track leading to it. Since 2010 two other areas have been similarly targeted on Winneys Down, west of Fernworthy and 3 miles from the nearest road. Another area, Flat Tor Pan, 2½ miles into the moor, is due to be subjected to machine work in the autumn. In each area the surface of previously undisturbed, healthy, deep and still growing wet peat has been (or will be) dug up in approximately metre-square blocks. These are then displaced to form numerous small dams, thus creating a network of small ponds, despite there being, on the surface of the peat, naturally developing ponds with their own ecosystems which have not yet been studied. The Dartmoor Mires Project (costing £1.1m funded over 5 years by rates raised by South West Water) is claimed to be ‘restoring’ 120 hectares of Dartmoor’s blanket bog (12,000 hectares in all). This is grossly misleading, as no evidence has been presented which provides a model for a ‘restored’ blanket bog. Even more seriously, no scientifically robust evidence has been produced to show that the blanket bog of Dartmoor has eroded or has dried out in recent or historic times any differently from how one would expect an 8,000-year-old peat bog to respond to fluctuations in climate and its own build-up of peat (6–8m in some areas). The Project Delivery Plan (June 2012, p.10) even states that ‘Reliable and accurate data on the extent and condition [of blanket bog] is not available’. No hydrological monitoring has been done on Winneys Down so we will never know whether the new ponds are making its two areas wetter or not. The public expects the highest principles of conservation management to be applied to national parks. One of these is the globally accepted precautionary principle of not interfering with natural ecosystems unless there is overwhelming evidence to justify doing so. No such evidence has been presented for the Dartmoor Mires Project. No evidence or arguments have been presented to justify moving from one area to another, on the basis that new data will be forthcoming. For the work proposed in August the project officer states merely that it will ‘explore the logistical and practical aspects of working’, rather than any specific scientific aim. Christopher Loughlin, the Chief Executive of South West Water, in a letter of 26 March 2013 to Geoffrey Cox MP, said that the work is being done to ‘reverse interventions of previous generations’. This statement, from the man in charge of the company funding the whole scheme, is entirely erroneous – the areas where work has been done and is planned shows no evidence of human interference such as peat digging, probably because the peat is too wet. To claim ‘restoration’ is scientifically meaningless, as no relevant evidence-based justification has been presented. the naturally developing ecosystems of healthy mires are being interfered with, counter to any precautionary principle. the absence of hydrological monitoring (except at Flat Tor Pan) negates any claim of the benefit of ‘rewetting’. no data has been presented to justify moving from one area to another. the current areas subject to machine work show no evidence of human intervention such as peat digging. the machines cause unsightly and sometimes damaging tracks. the wild and tranquil character of the wildest landscape in southern England is being compromised by the appearance of large modern machinery, which affects people spiritually and emotionally. The Dartmoor Society urges all reasoning people, interested in the proper conservation management of Dartmoor, based on scientific principles, to call for an immediate halt to the machine activity of this project which is changing the face of Dartmoor and altering our blanket bogs with unknown consequences.